Kids Can Press, 9781771387200, 32pp. Award-winning author Elizabeth Suneby's thoroughly researched and inspiring story introduces young children to the problems associated with open-flame cooking in the developing world, as well as background information on sustainable technology. 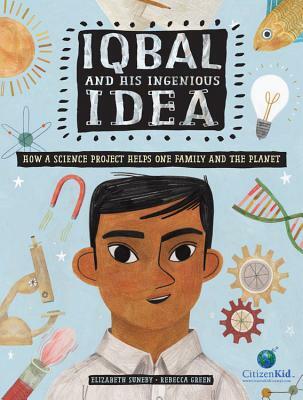 Part of the CitizenKid collection, this book uses the common experience of a science fair project to help children recognize that they, too, can help make the world a better place through innovative thinking and creative problem solving. The artwork by Rebecca Green, filled with details of everyday life in a Bangladesh village, beautifully evokes a sense of place and culture. Iqbal offers a perfect example for the character education subject of initiative. End matter includes information about clean cookstoves, a DIY solar cooker activity and a glossary. Elizabeth Suneby loves words! Writing helps Liz come up with new ideas, learn new things, figure out her feelings and express them to others. Writing is also how Liz earns a living. She writes content for companies large and small. She writes magazine articles. And she writes books for children and teens that help kids find their voice in a hopeful world. Rebecca Green is an illustrator and painter whose work can be found in children's books, magazines and galleries. She lives in Nashville, Tennessee.